“The Bible is central to the study and practice of Christian Science and its system of healing. Through the study of the Bible, Mary Baker Eddy found not only inspiration and guidance, but what she believed were the spiritual laws of health and healing that undergirded Jesus’ teachings and works. 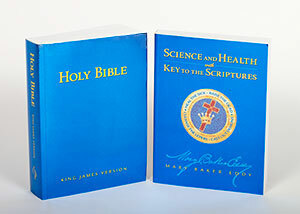 “Science and Health with Key to the Scriptures is Mary Baker Eddy’s primary work and the definitive textbook on Christian Science. It explains the scientific laws behind the teachings and healings of Christ Jesus. “From the first chapter, ‘Prayer,’ to her exegeses of Genesis and Revelation, the author invites readers to deeply consider the allness of God, the perfection of man as God’s spiritual creation, and how an understanding of these facts brings healing—just as it did in biblical times. “Christian Scientists regularly study Bible Lessons, published in the Christian Science Quarterly, which consist of correlated passages from the Bible and Science and Health with Key to the Scriptures, the basic texts for the study of Christian Science. “Every day, Christian Scientists apply what they learn from their study in healing disease, injury, and all kinds of other problems, plus praying for the world. These two books, as well as the Bible Lesson-Sermon, can be studied and/or purchased in our Christian Science Reading Room at 2340 Chatsworth Boulevard, San Diego, California 92106.